Type Management agreement between owner of a gasoline filling station and an operator manager who will operate the station pursuant to the management agreement. Features Managemant agreement specifies the duties of the manager, which include operation of the station, supervision of employees working at the station, negotiation of leases, licenses, concessions, and other contracts pertaining to the station, maintenance of the improvements, and preparation of financial statements for the business, among other things. The agreement contains general covenants of both the owner and the operator, provisions regarding termination and assignment, and the like. This AGREEMENT is made as of _______________, 20__, between PETROLEUM PROPERTIES, INC., a corporation organized under the laws of the State of ________, with offices located at _______________________ (“Owner”), and FILLING STATION OPERATOR, ______________________, a corporation organized under the laws of the State of __________, with offices at _______________ (“Manager”). WHEREAS, Owner has determined to contract the management of Owner’s Service Station to Manager. NOW, THEREFORE, in consideration of the mutual promises and covenants contained in this Agreement, and subject to the terms and conditions hereof, Owner hereby engages and contracts with Manager, and Manager agrees to serve as the Manager of Owner’s Service Station on the terms and conditions hereinafter set forth. 1.1 Operations. Manager shall operate Owner’s Service Station in accordance with the standards and policies with which it operates the Other Managed Gas Stations owned and/or operated by it, provide such services and products as are customarily provided by Manager in its operation of the Other Managed Gas Stations, and consult with Owner and keep Owner advised as to all major decisions as set forth in Section 1.13 affecting the operations of Owner’s Service Station. Manager, at Owner’s expense, shall have sole discretion in the operation, direction, and management of Owner’s Service Station, including, without limitation, the personnel policies, credit policies (including the execution of agreements with credit and charge card organizations), terms of purchases including all fuel purchases, charges for services and products, purchasing of operating equipment, maintenance of Owner’s Service Station, repairs to and replacements of furnishings and equipment, the institution of such legal proceedings as are necessary in connection with the operation of Owner’s Service Station, and all phases of advertising, promotion and publicity relating to Owner’s Service Station. 1.2 Management of Owner’s Service Station Personnel. (a) Manager shall hire, promote, discharge and supervise all employees and/or independent contractors of Owner’s Service Station and employ, pay at Owner’s expense, supervise and discharge all employees and personnel necessary for the operation of Owner’s Service Station. Manager shall, in hiring all management staff and other operating and service employees for Owner’s Service Station, use or cause to be used reasonable care to select qualified, competent and trustworthy employees. Manager shall be responsible for acting and have authority to act on behalf of itself or Owner in any dealings which may be necessary with any labor union or other employee bargaining organization representing or seeking to represent any employees of Owner’s Service Station. (b) All management personnel and employees employed in the operation of Owner’s Service Station shall be employees of Manager, and shall be under the control of Manager in accordance with the programs and policies of Manager from time to time. Manager shall pay the compensation, at Owner’s expense, including salary and benefits, payable with respect to these employees. Manager shall be responsible for all required state and federal tax reporting, withholding, disbursements and other record keeping functions incidental to the employment of the employees of Owner’s Service Station. 1.3 Negotiation of Leases, Licenses, Franchises, Concessions and Other Contracts. 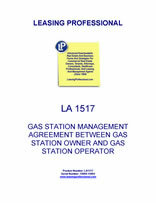 Manager shall negotiate leases, licenses, franchises, concession and all other agreements and contracts incidental or deemed appropriate by Manager in the operation of Owner’s Service Station, consistent with the actions that Manager takes in similar circumstances in connection with the Other Managed Gas Stations it operates. All such agreements and contracts shall be in Manager’s name, either in its own right or as agent for Owner, shall be executed and delivered by Manager, and shall be performed by Manager as agent for Owner at Owner’s expense. 1.4 Utilities, Services, Etc. Manager shall enter into contracts and agreements in the name of Manager or Owner, and at Owner’s expense, for the furnishing to Owner’s Service Station of utilities and services, including, but not limited to, electricity, gas, water, steam, telephone, cleaning, vermin exterminators, scales and boiler maintenance, air conditioning maintenance, dry cleaning service, and any other utilities, services and concessions, including security services, which are customarily provided or entered into by Manager incidental to its ownership and operation of Other Managed Gas Stations owned and/or operated by Manager. 1.5 Procurement. Manager shall have sole authority to make and execute, or supervise and have control over the making and execution of, all decisions concerning the acquisition of retail and other inventory for Owner’s Service Station, including all fuel and other petroleum products. Manager, at Owner’s expense, shall purchase or arrange for the purchase of all inventories, provisions, furniture and equipment, and operating supplies, which, in the normal course of business, are necessary and proper to maintain and operate Owner’s Service Station consistent with the standards and the manner in which Manager maintains and operates the Other Managed Gas Stations owned and operated by Manager.